Guns and pistols are constant sites in action scenes in mangas. From big guns and rifles, palm-sized pistols, shoot-outs are the standard scenes in action series. 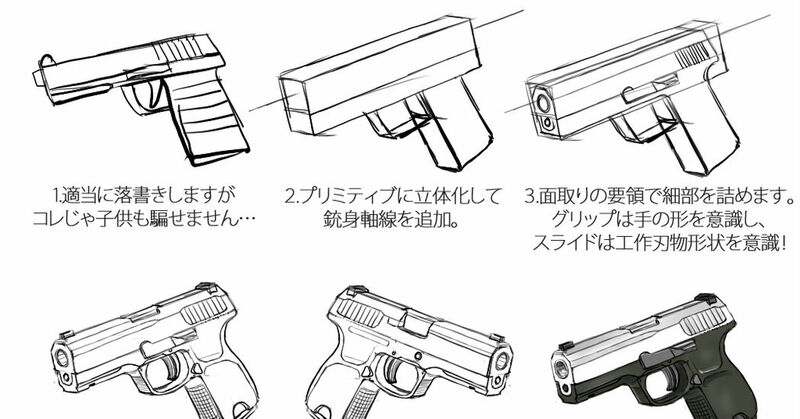 However, it may be hard to draw such guns as we don’t get to see them in real life. I’m sure there’re many who puzzle over how do make them look cool, so let us introduce to you a series of tutorials on how to draw guns. From the fundamental mechanisms to specific skills, try it out with your own drawings. From how to hold such weapons, to poses struck when shooting, learn various tips on drawing action scenes. Enjoy! Shot in a blink-of-an-eye! Pistol-wielding boys! Bow and Arrow - Girls with Weapons!